You are currently browsing the archives for the Environmental Activism category. The worst part of this is that it’s happening in the closing days of the campaign and Nancy Pelosi doing everything she can to tamp down talk of impeachment until after the election. Pelosi’s ‘Democrat base’ problem is that she can’t turn this off without hurting turnout. Further, this is precisely the type of thing that’ll be used to create new ads that’ll turn independents away from the Democrats. The NRCC will likely use this in ads in virtually every swing district in America. I’m definitely thinking it’ll be used in MN-8, where President Trump is especially popular. Democrats are in God’s Little Acre — east of the rock, west of the hard place. 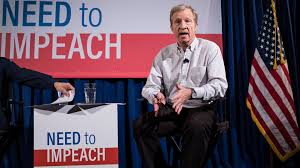 They can’t afford not to do what Steyer wants. If they reject him, they lose north of $100,000,000 per cycle in contributions. If they accept, voters reject them. That isn’t a great position to be in. This pdf article should cause the DFL tons of heartburn. It isn’t a secret that a high percentage of DFL activists are anti-mining. That’s been documented repeatedly on LFR throughout the years. This article, though, is different in that it highlights what’s getting lost in the discussion. 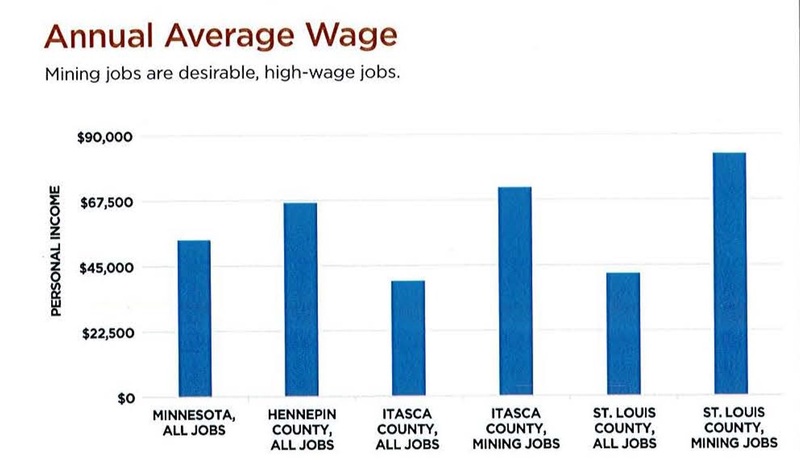 The chart below shows the average annual wage for jobs in Hennepin, Itasca, and St. Louis counties, along with the average of all Minnesota counties. 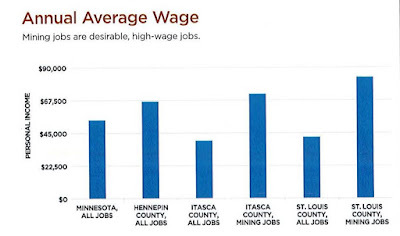 The average annual wage in Hennepin County is approximately $66,600, far larger than the average income for non-mining jobs in northern Minnesota, where wages are $12,000 lower than the state average. Residents of the Twin Cities metropolitan area often take their relatively high wages for granted, but jobs paying more than $66,000 per year are difficult to come by in northern counties. The average income in St. Louis County, for example, is approximately $42,000—and average mining jobs pay $83,235, nearly twice that amount. The anti-mining wing of the DFL is standing in the way of mining families making a more-than-middle class wage of $80,000+. That’s immoral. That’s before taking into consideration how much these communities need those incomes to rebuild those communities, those neighborhoods, those families, those lives. Instead of living in poverty, these communities could live in prosperity. Think of the economic growth that’d happen if PolyMet and Twin Metals opened. Then think of how much better off we’d be if we built pipelines and other types of energy infrastructure. Instead of balancing budgets by raising taxes, Minnesota could do something that’s entirely foreign to the DFL. Minnesota could balance budgets through robust economic growth. That’s what it did during the Perpich years. Now, the DFL, the party that gave us Gov. Perpich, hates the people that Gov. Perpich loved. The Flambeau Mine, a 35-acre surface mine located just south of Ladysmith in northern Wisconsin, illustrates how the environment and groundwater quality can be protected at an acid-generating mine. Over four years (1993-1997), the Flambeau Mine produced 181,000 tons of copper, 334 ounces of gold, and 3.3 million ounces of silver. At its peak, the mine provided nearly 100 family supporting jobs and paid more than $27.7 million in taxes into a state fund that was returned to the community to promote long-term business development. Today the closed and restored mine site is an interpretive nature center, a recreation area, and a business park. Reclamation took about two years to complete and cost $20 million, and produced a 150-acre site that includes four miles of nature trails and five miles of equestrian paths that wind their way through a beautifully restored open space. 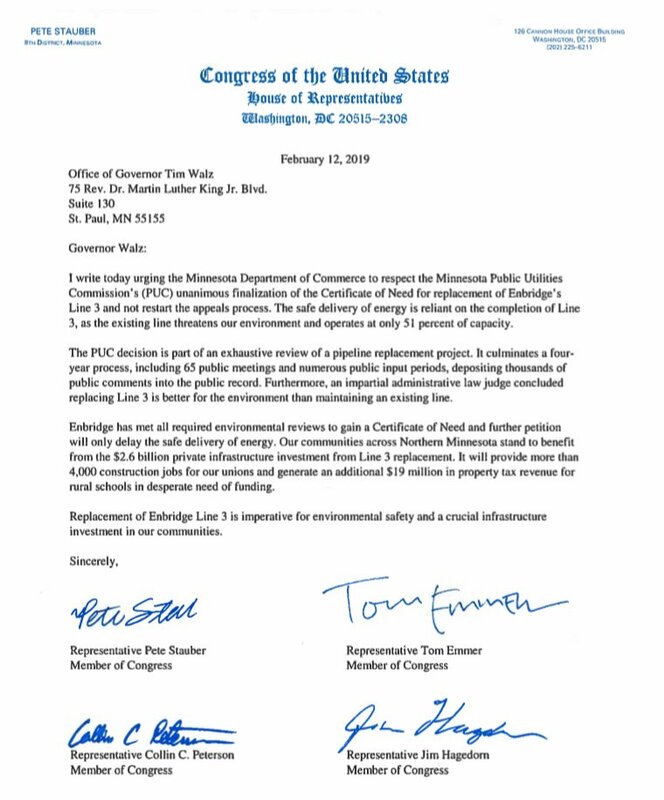 The anti-mining wing of the DFL says this mining can’t be done safely. Mr. Painter said that in the video. They’re either both wrong or they’re both intentionally lying. Both things seem possible. Threatened status benefits species and people in two situations: (1) it provides Federal protection before a species reaches the brink of extinction; and (2) in the case of species that were initially listed as endangered, threatened status also allows scaling back Federal protection as they recover and no longer need the maximum protections of the Act. State natural resource management agencies designated by the Service may “take” (kill, wound, trap, or move as defined by the Act) individuals of a threatened species in pursuit of conservation programs for the species. 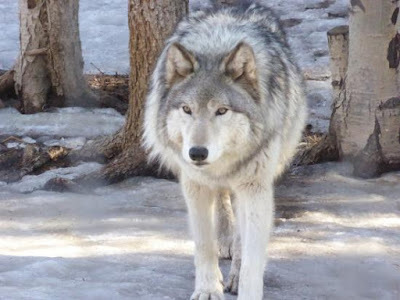 In contrast, those agencies are prohibited from “taking” an endangered species if the action might kill or permanently disable the specimen, move it to another state, move it beyond its historical range, or keep it in captivity for longer than 45 days. The environmental activists to which Sen. Housley refers have argued, literally, that species that’ve been put on the endangered species list are forever at risk of extinction. In their mind, the ESA, aka Endangered Species Act, should protect endangered and threatened species alike with equal ferocity. The thing about environmental activists is that they’re never willing to accept the fact that the ESA worked. If they did, they’d be much less rabid and much more moderate and tolerable. This is what’s wrong with Minnesota’s regulatory system. Or they could choose to throw darts at the report and ignore it entirely. I’m half-kidding, of course. It isn’t surprising that these projects take 10+ years to approve. 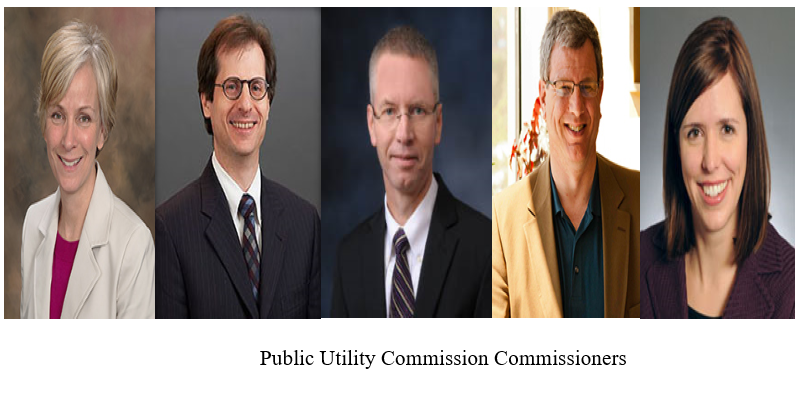 The market should determine whether a pipeline is required. The last thing we need are a bunch of political busybodies telling us what we need and what we don’t. These aren’t experts. They’re activists with different opinions. 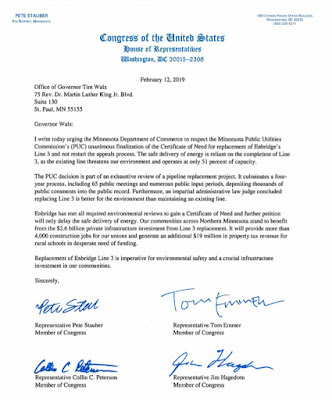 Minnesota needs layers of regulators like property owners need arsonists on their payroll. It’s time to streamline this process so a quick decision can be made. Further, it’s time to call these environmental activists out. They’re putting themselves first instead of putting the country first. Put a different way, these environmental activists aren’t patriots. They should be ashamed of themselves. Period. I just got off the phone with Mitch Berg, who told me that Erin Murphy has picked Erin Maye Quade to be the Lt. Gov. candidate on her ticket. I told Mitch that nothing says geographical and ideological balance like a pair of gun-grabbing Metrocrats that hate mining. BTW, you’ll want to read Mitch’s upcoming post to hear his perspective on this. Trust me when I tell you that he’s got a perspective that you won’t hear from the Twin Cities media. Maye Quade is serving her first term in the House and previously worked for U.S. Rep. Keith Ellison doing constituent services and organizing for DFL campaigns. She is a lifelong resident of Apple Valley, where she lives with her wife, Alyse, who also organizes for the DFL Party. Here’s the thing: Erin Murphy hates farmers almost as much as she hates miners, loggers and gun owners. The thought that Murphy and Quade will appeal to more than 12% of rural voters statewide is ridiculous. I’ve got to think that the NRA is chomping at the bit to go after this ticket. In the Eighth, I’m betting that there are tons of DFLers that can’t wait to vote against this ticket. I wouldn’t be the least bit surprised if they vote for one of the GOP tickets. Ken Martin won’t admit it but he’s got to be afraid of what this ticket would do to the DFL this November. Minutes after Tim Walz withdrew from the endorsement fight, the DFL endorsed Erin Murphy to be their gubernatorial candidate. This was an event-filled, tumultuous, convention. The first shock happened when unknown Matt Pelikan trailed DFL Attorney General Lori Swanson by just 5 points, with Swanson at 52.2% and Pelikan at 47.2% of the vote. Before they started the second ballot, Swanson pulled out, handing the endorsement to Pelikan. 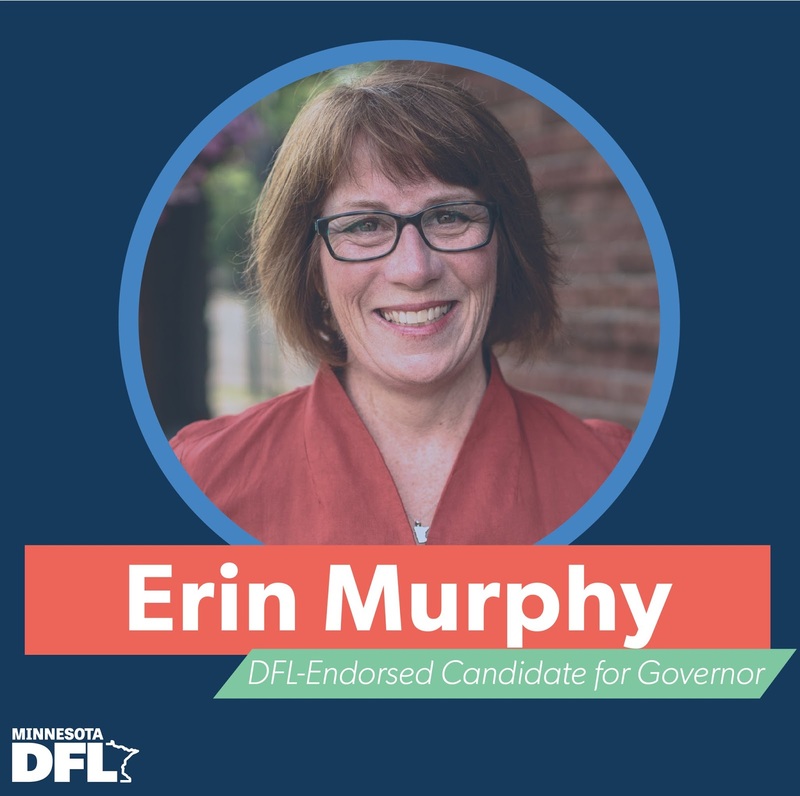 When Erin Murphy won the endorsement after Tim Walz withdrew from the endorsement race, rumors started swirling that Swanson might jump into the DFL gubernatorial primary instead of fighting through the DFL AG primary. Meanwhile, another rumor has it that Ryan Winkler will run in the DFL AG primary if Swanson opts for the DFL gubernatorial primary. If AG Swanson runs in the AG’s primary, she’d probably win. If she runs in the gubernatorial primary, her chances of winning drop significantly. In both instances, though, her chances of winning the general election aren’t that great, though they’d be better if she ran for AG. As for Murphy’s chances, they aren’t good. If she defeats Tim Walz, she’ll only do so by running far to Walz’s left. Single-payer health care isn’t popular in Minnesota. People didn’t trust MNsure. They definitely won’t trust single-payer. Further, it’s quite possible that she’ll lose to Tim Walz while pushing him farther left than Walz can afford to go to win the general election. Murphy’s victory makes life difficult for Chairman Martin because it’s dragging the supposed frontrunner farther left than Martin wanted. Next, whoever wins will have gotten dragged so far left that it’ll be virtually impossible to win in November, mostly because Murphy is a hostile environmental activist. To win, she’ll have to alienate miners and union construction workers like pipefitters. Think heavy equipment operators, too. This isn’t the script the DFL wanted written at convention-end. Most likely, they’ll have primaries in Tina Smith’s seat, the open Nolan seat, the possibly open State AG seat and the governor’s race. It’s the exact opposite of what Chairman Martin hoped for. Finally, this situation virtually guarantees a Republican governor in November. Add to that the likelihood of Republicans winning the auditor’s race and the definite possibility of Republicans winning the AG race, coupled with the strong likelihood of maintaining their majorities in the Minnesota House and Senate and you’re looking at a pretty difficult year if you’re Chairman Martin. That’s before mentioning the likelihood of winning the First and Eighth U.S. Congressional districts. This year, Minnesota has none of the makings of a blue wave. If Democrats want to have a chance at winning back the US House, they’ll need to prove that they won’t consistently side with Big Environment, aka Big Green. During the Obama administration, Big Mining got the shaft without getting the mining project. Salena Zito’s latest article suggests that Democrats are rebuilding their relationship with Big Labor. The union voters I talked to said they didn’t feel that Democrats in Washington had their back; that they were too progressive, too strident, and way out of touch with their lives and needs. “I think there were two factors at play with how union members, many union members turned away from the Democratic Party,” said Mike Mikus, a western Pennsylvania Democratic strategist who does campaign work for several unions. One is that they didn’t feel their economic issues needed to be addressed and pretty frankly it was in the Democratic playbook to play to the center meant taking on organized labor rather than any other Democratic constituency,” he said. I’m not convinced that Democrats have figured it out yet, though. I don’t doubt that some Democrats have made the decision to support mining. That will give those Democrats a fighting chance in some districts. The problem is that they’re still part of a Democratic Party that’s dominated by environmental activists. Tom Steyer and Alita Messenger won’t tolerate a significant shift back to mining, which is where most union workers are employed. The other industry where lots of union workers are employed is construction. Democrats still fight tooth-and-nail against pipeline projects. If I ran the NRCC, I’d remind voters in the heartland that Democrats are still funded by environmental activists. As long as that’s the case, labor will get shafted by the Democrats.